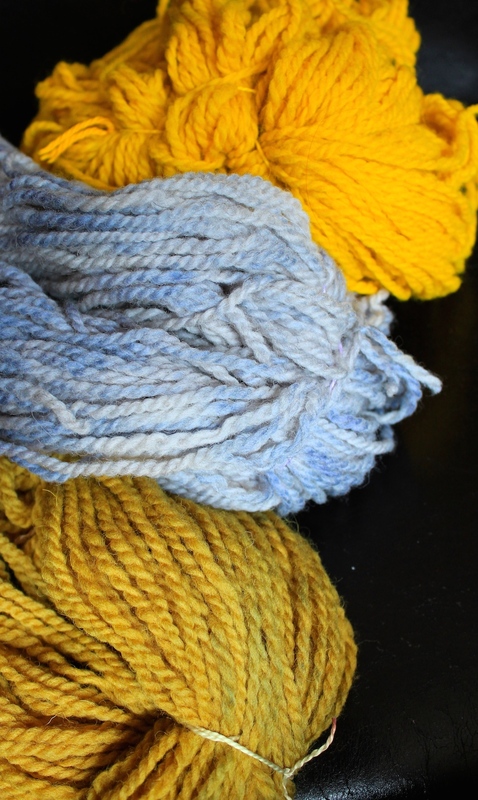 NOTE: Skeins in this shot haven’t been rinsed since the initial dyeing. 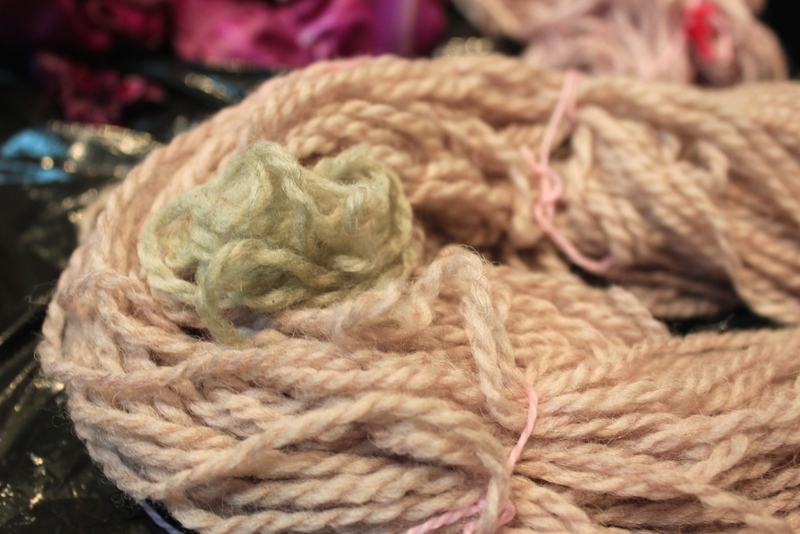 Last week, I signed up for a Natural Dyeing course that took place over two evenings at the Knit Cafe here in Toronto. It was a small class, only 5 of us plus the instructor and the store owner. A great size because we were able to chat, ask lots (LOTS) of questions ;), plus the space isn’t huge so it was a comfortable setting for the 7 of us. 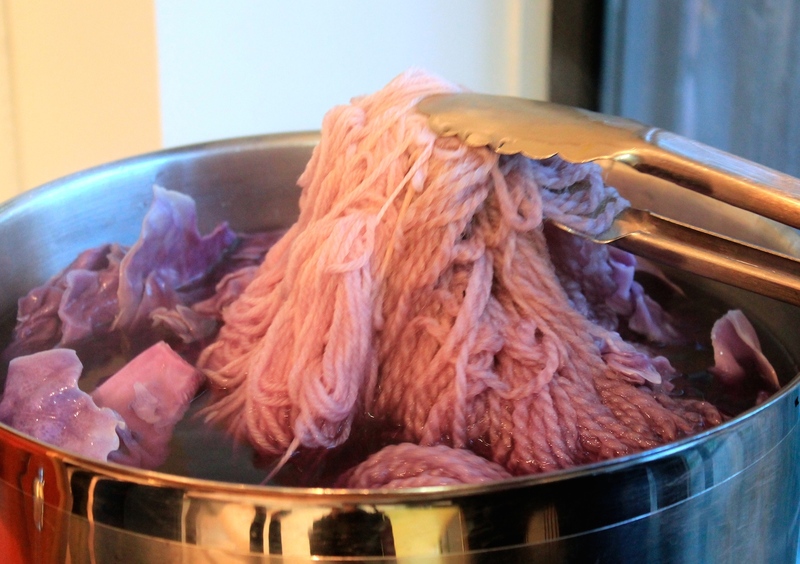 I went in knowing a bit about dyeing yarn as a friend and I experimented recently with food colouring, but we had used vinegar as a mordant and stuck with food colour gels. 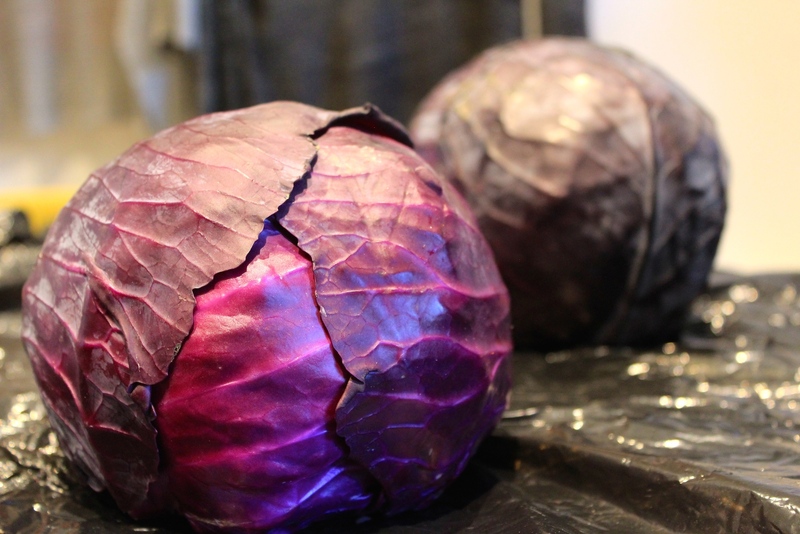 In this class we learned to used alum/cream of tartar as a mordant and we dyed with food and food waste….it was a lot of fun and I learned a lot! 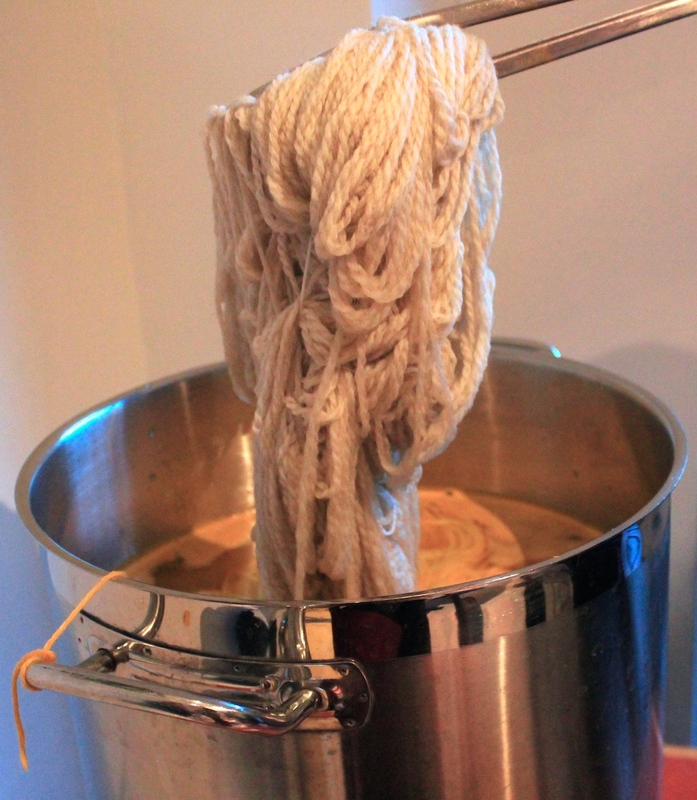 The first evening we washed our wool and then placed it in a mordant bath. Washing included placing the wool in water mixed with a squirt of mild soap (like Dawn) and squeezing the wool to ensure it was wet and to get rid of air bubbles. We heated the water for about an hour to remove any dust, dirt, chemicals etc. 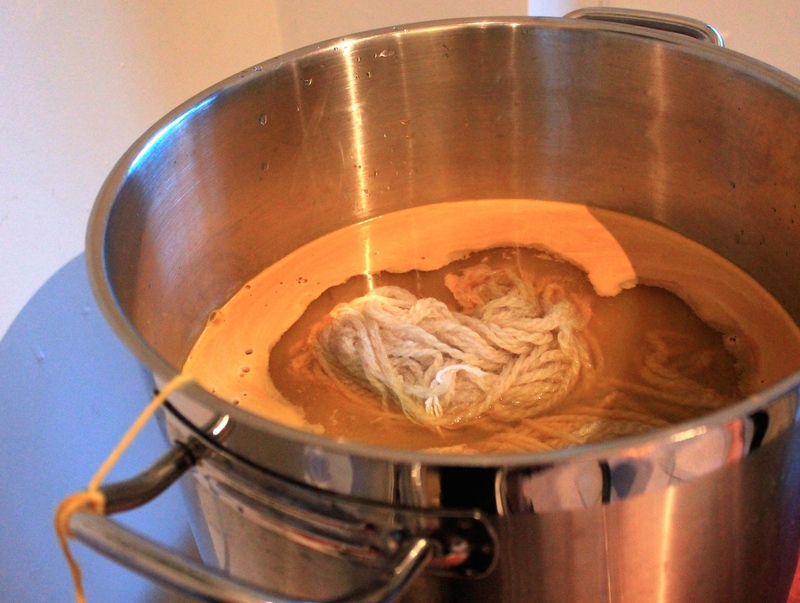 I thought our wool looked pretty darn clean but the water at the end was pretty brown! The mordant we used was 20% alum and 6% cream of tartar. 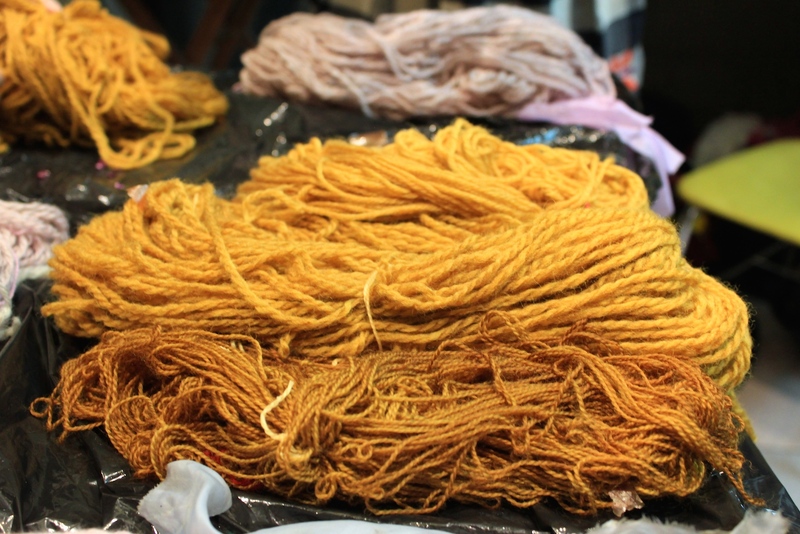 The percentage refers to the weight of the mordant compared to the weight of the fibre that was to be added. We filled large stainless steel soup pots with water, brought the water *almost* to simmering and added the mordant mixture, followed by our wool skeins. The pots remained on the heat for another 30 mins or so, until the class ended. The wool stayed in the mordant overnight and the next day, the teacher went in about an hour early and turned all the pots back on, bringing the water back up to *almost* simmering. Then….we starting mixing up the dye pots! 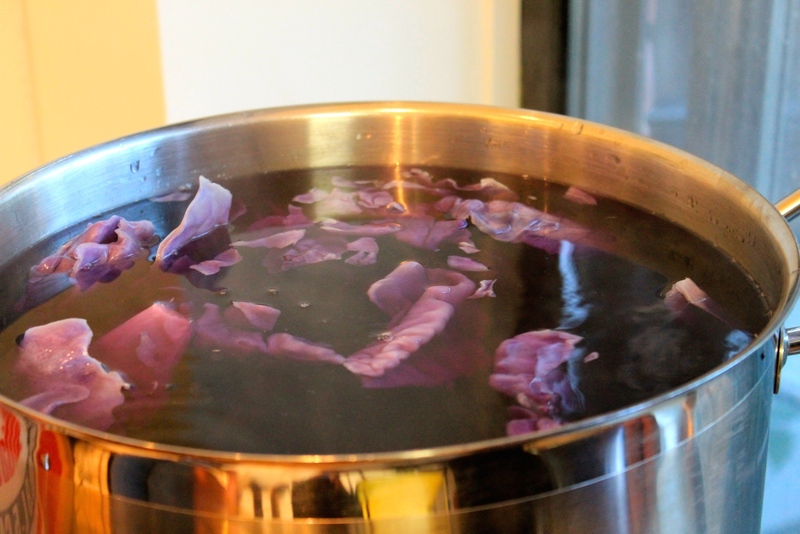 The first dye pot used red cabbage. The bottoms were chopped off we could simply peel away the layers. 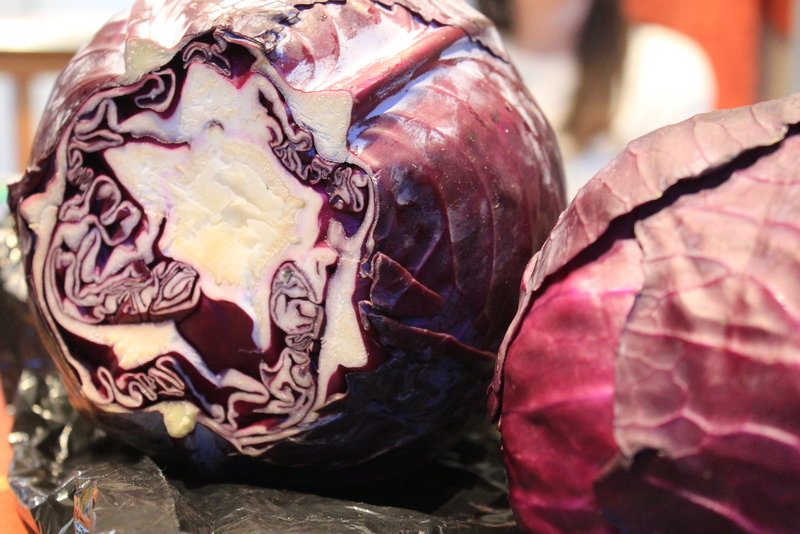 We used almost the whole cabbage except the very middle where the colour started to lighten. Then we added water and brought it to a boil. 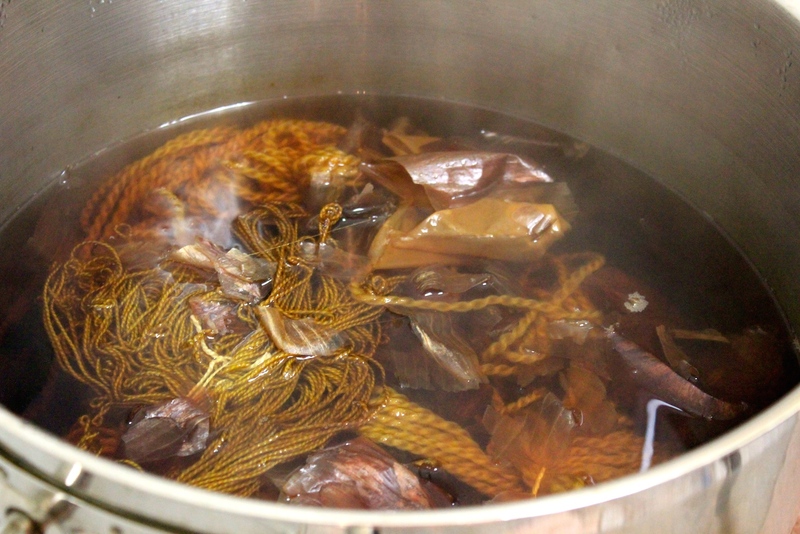 When the dye water is 50 degrees, you can add the wool and continue heating until you are *almost* boiling. You don’t want a rolling boil as that agitate the wool and result in felting. Well, in this case, we added the wool before it reached boiling….due to limited time and the fact that the small burners we were using were having a hard time bringing such large amounts of water to a rolling boil. We also left the cabbage leaves in the pot with the wool….again, due to limited time. It appeared to be dying the wool a pinkish-purply colour but in the end, the colour softened quite a bit and wasn’t the vibrant shade you would expect. Gloves! Gloves, gloves, gloves! Plus garbage bags or some other plastic protection…. 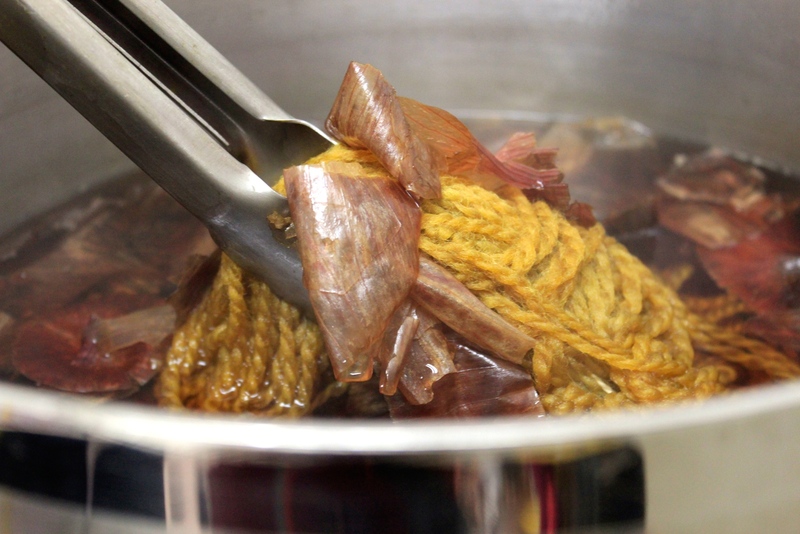 Use tongs to place each skein into its respective pot…but be sure to keep the turmeric tongs separate! 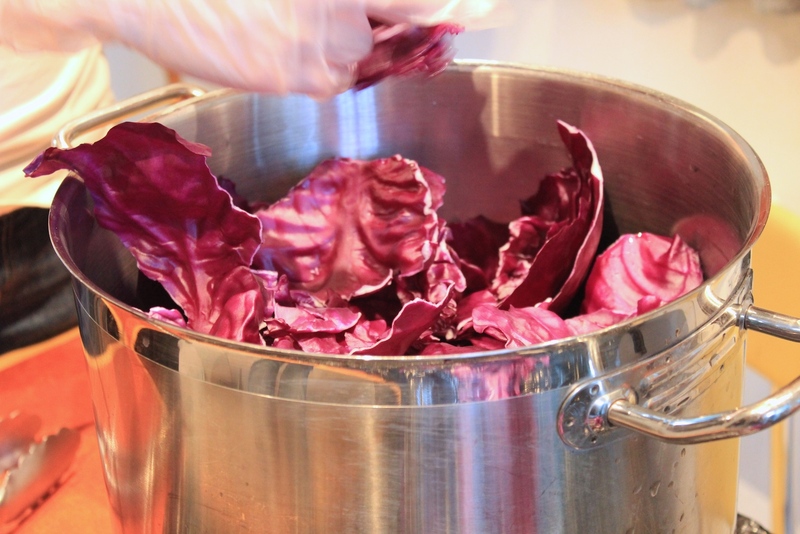 It is a gorgeous colour and well worth experimenting with…not to mention it smells pretty good…unlike the boiling cabbage! In this pot, we placed 800g of turmeric, two large bags. The instructor had a nylon bag that she told us she always uses with turmeric. It allows the water to flow throughout the spice and it keeps the granules from getting caught up in your fibre. In terms of heat, it was prepped similar to the cabbage prepping mentioned above. Again, another food item that I sort of expected to equal a brilliant dye colour, but didn’t. As you can see, minutes after we added the yarn to the pot, it had already started to turn. 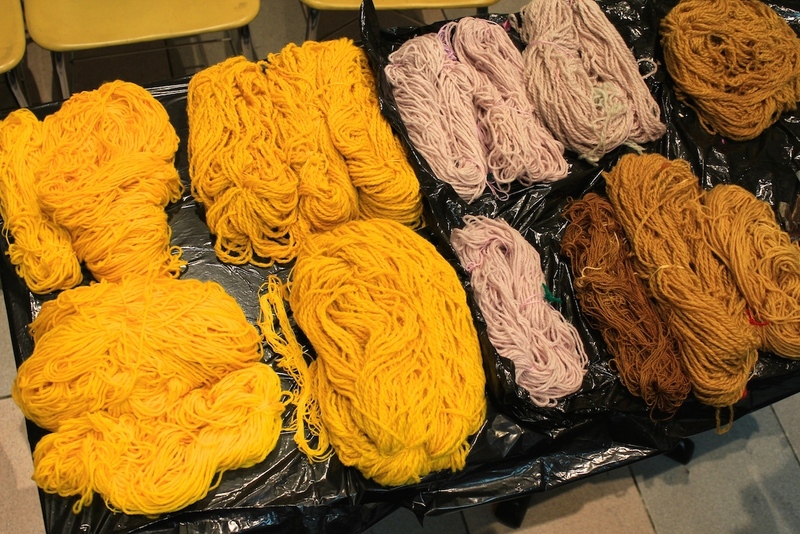 All of our yarn stayed in the dye pots for about an hour to an hour and a half. Again, our class had limited time so the point was really to experiment with the dyes and learn about the process so that we could return home and practice ourselves. Hard to capture the colours properly due to tungsten lighting next to a patio door with natural light…but as you can see, they all turned out a bit different. If we had had the time to leave it longer, we were told that it would have become more of a deeper orange. Trying to be artsy with my turmeric yarn! The photo above makes it look pink, but it resulted in more of a slightly pink but more blueish grey. The initial picture at the top of this post captures the colour much better. This gave us a yellow-brown colour. Quite pretty actually! 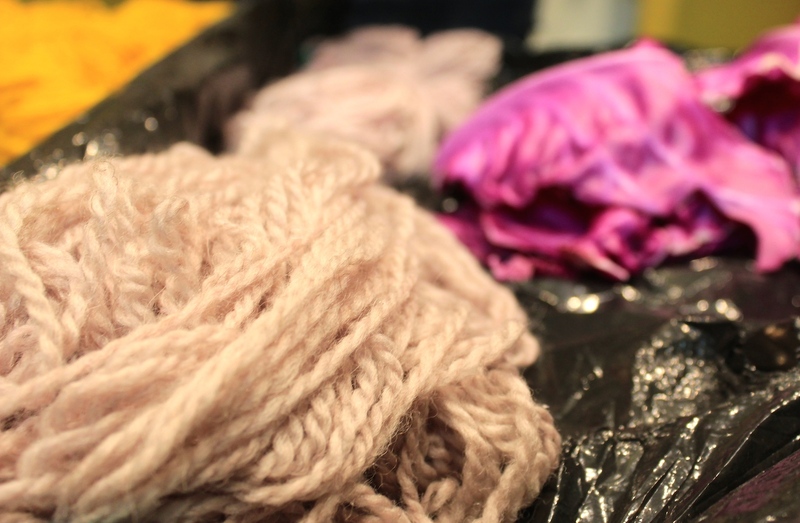 We each had purchased our own wool and you can see clearly in this picture that different yarns take dyes in different ways. The front skein ended up much darker but the process was the same for both skeins. One other cool thing we learned about was the use of Iron to darken and sometimes completely change a dye colour. 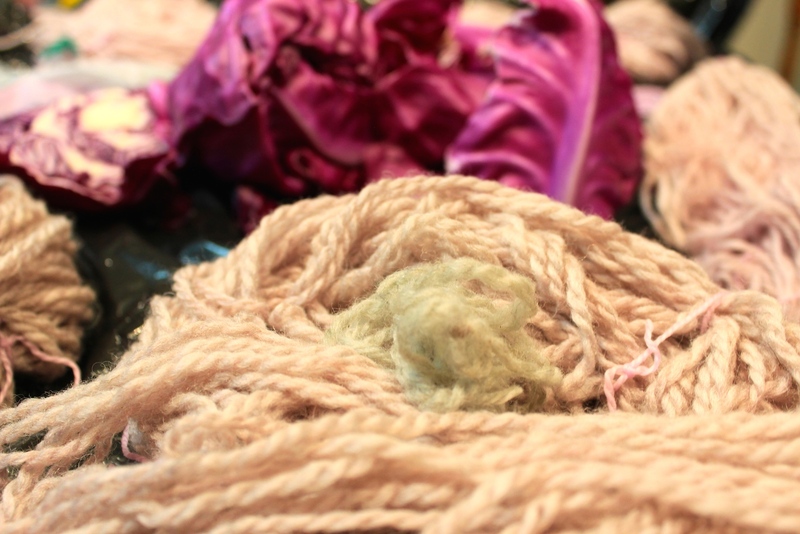 A piece of the red cabbage yarn was used as an example. Any rust would do. You grab a bunch of rusty metal bits and boil them. Ignore the yellow yarn. This was at the end of the night when we discovered that there wasn’t enough iron to dye anything more. Then you dip in your yarn and in many cases, it changes almost immediately! 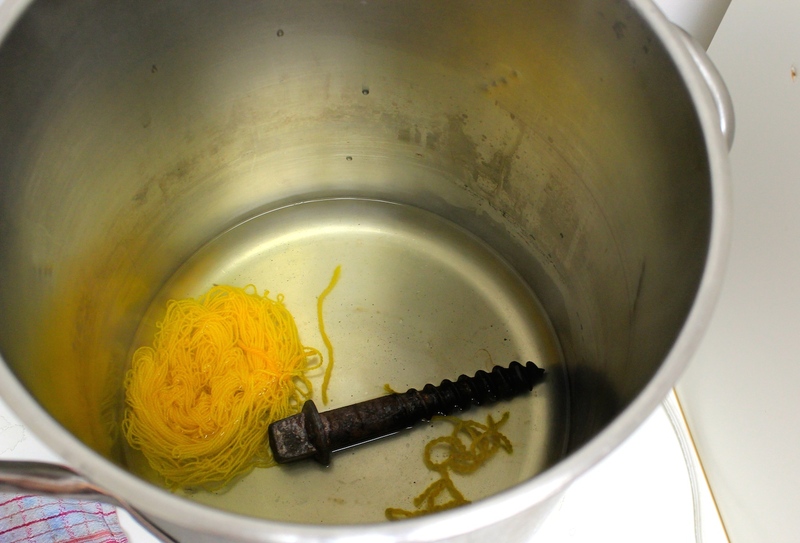 The little piece sitting atop the skein in the middle was dipped in the iron water. I’m hopeful that you can see the difference between the little piece in the centre of the pic above and the remaining skein wrapped around it. That little piece was dipped into the iron water and turned a gorgeous warm blue-grey. One more picture to share…. 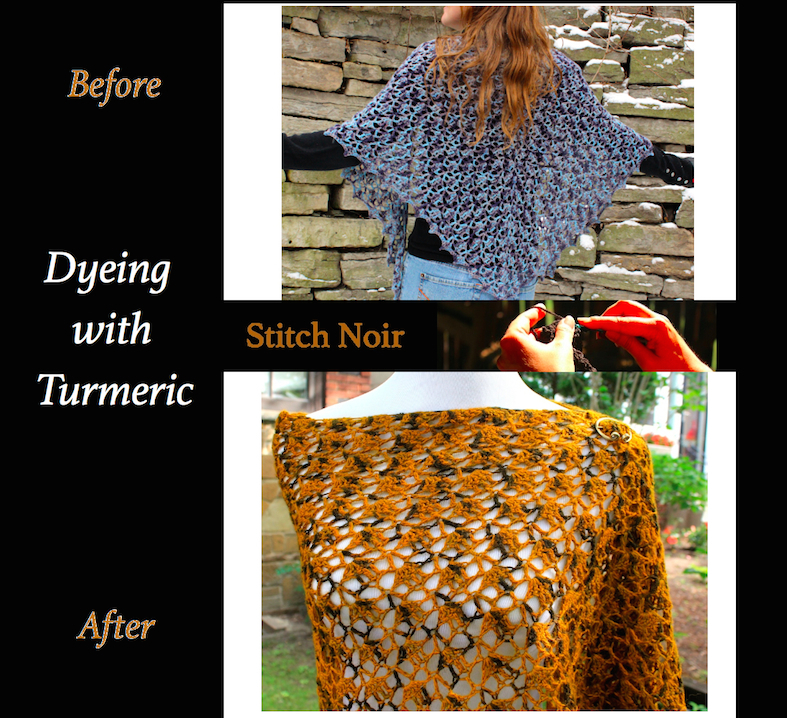 Near the end of the second class, I asked if there would be enough turmeric left in the pot to dye a shawl. I had had this shawl on hand for about a year, crocheted it myself, but the winter hues and icy colours weren’t doing it for me. 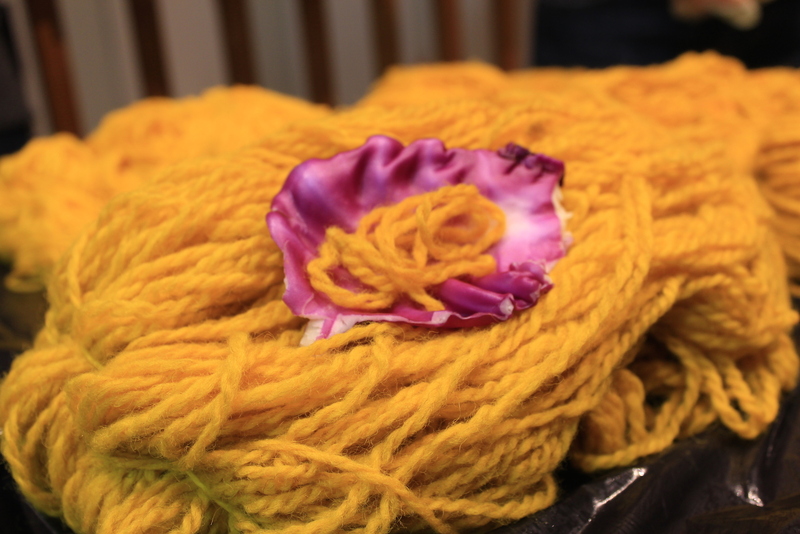 With 800g of turmeric in the pot, there was *definitely* enough so I also dyed my shawl. I prefer the warm autumn colours to the previous colder ones so I consider it a successful experiment!